COMING SOON on ENDE RECORDS......!!! "Classic 1970s style Synthwave, prog electronic, industrial noise, drone and melodic modulations from veteran electronic producer of 40 years Steve Munslow. Mostly melodic and pleasant but at times challenging and enduring. A real cinematic eargasm. It might be Hyperex Machina's best album yet. " 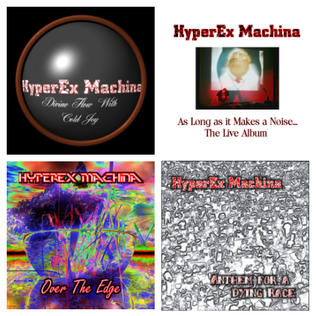 HyperEx Machina started out in 2001 as a side project to the infamous Hyperdriver. Following a live performance at AmbientLive 2k1 in 2001 and the subsequent live album recorded at the event the "side project" tag was dropped as it took on a life of it's own. HyperEx Machina previously released CDs on AmbientLive but has recently been on the ENDE Records netlabel. I thought it was time to get the rest of the music out in downloadable form. This will take some time as there is a lot of music to upload. So, you streamed an album and you'd like to own a physical copy rather than download. No problem, a lot of HyperEx Machina stuff is available on CD through AmbientLive.